by Brianna Crandall — March 22, 2019 — Controlling a work light shining over the entire jobsite or dark project area can be tricky when it’s strapped to the rafters. That’s why global power tools manufacturer Bosch is introducing what it calls the future of connected lighting. The Bosch GLI18V-1200CN 18V Connected LED Floodlight with Bluetooth offers users full control over the smart area light using a mobile device. 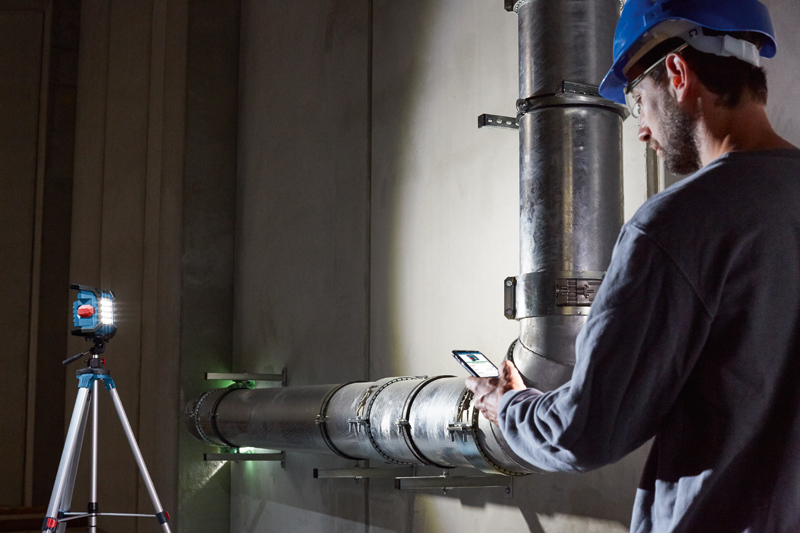 Construction and facilities professionals and technicians can now turn the mobile light on and off remotely, dim the light to the desired brightness, put it on a timer and even check the battery — all from the free Bosch Toolbox App. 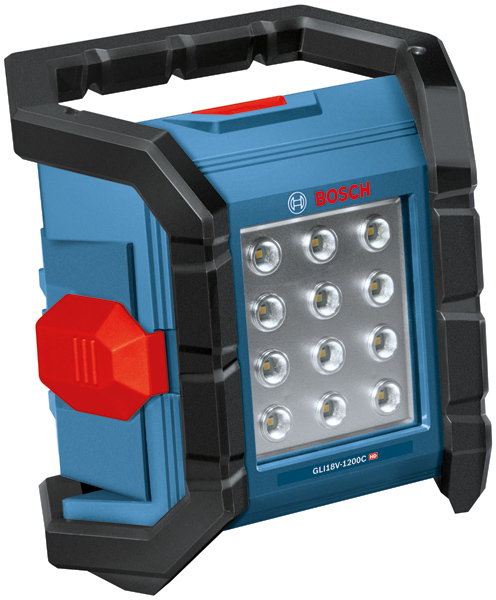 The Bosch GLI18V-1200CN mobile work light is not only smart, but comes packed with features to withstand the most rugged jobsite conditions. Along with the area light’s protective roll cage, the tool’s IP64-rated cover is resistant to dust and water damage. Plus, it has five setup positions so pros can find the ideal angle to effectively illuminate a large work area. In addition, the cordless Bosch GLI18V-1200CN is a light engineered to last through the day. It works with the rechargeable Bosch 18V system to provide outstanding runtime. The light intensity is adjustable, with a lower, dimmed mode setting for longer runtime — up to 17.3 hours on a CORE18V 8.0 Ah battery (not included). At 1,200 lumens, it provides 10.6 hours on the Bosch 8.0 Ah battery. Bosch is always looking to create a smarter, more efficient jobsite, and the new 1,200-lumen smart light does just that. Not only does the GLI18V-1200CN make it easier than ever to illuminate an entire jobsite at the touch of a button, the CORE18V battery gives it enough juice to last throughout the workday, even at its brightest setting. The free Bosch Toolbox App, which is available at the Apple App Store or the Google Play Store, works with both Android and Apple devices and allows connection to the area light from up to 100 feet away via Bluetooth. The Bosch GLI18V-1200CN LED Floodlight comes as a bare tool; the battery and charger are sold separately. To learn more or to find a local dealer, visit the Bosch website. Beat the heat — see how these new fan jackets help protect workers either outdoors or in close quarters July 27, 2018 In "Products and Services » Safety and Health"
If your concrete is flaked or pitted, create a permanent wear-resistant surface with QUIKRETE’s new resurfacer February 22, 2019 In "Products and Services » Building Products"
For your restoration or construction cleanup, see how this dehumidifier filter reduces internal build-up and resists bacterial growth January 30, 2019 In "Products and Services » Cleaning Equipment & Supplies"